Ok, this picture wasn't taken today, but it's January, it's dreary and wet, and I need a reminder of the good times. 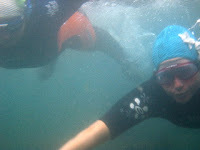 This was me and a friend attempting to swim around Burgh Island a couple of summers ago (remember when we had summers?). The highlight of that swim was a glowing pink starfish shining like a tiny underwater beacon on a rock. May there be many more swims and starfish this summer. Friends who recently visited Foggintor Quarry described it as "a strange, rather creepy place", so naturally we were keen to go, and swim in it of course. As we trudged across the High Moor, whipped by icy winds, the thought of stripping off and plunging in seemed increasingly unattractive. However, once inside the quarry, there was no wind. It was very sheltered and very quiet with a calm beauty about it. Apparently stone quarried from here was used to build Nelson's Column. If you look carefully at the second picture you will see four small dots like pebbles in the water. That's us. Found a previously undiscovered (by us) stretch of the Dart, with a particularly unworldly quality. The river bed here is slate green and the effect is captivating, with slow moving water making its way through strangely coloured and contoured pools. It sort of looked like an underwater version of a relief map of Dartmoor. A friend of ours is of Ukrainian descent and invited us to Christmas Eve dinner, which the Ukrainians celebrate at Epiphany. We arrived to a house ablaze with candles and fairy lights. Twelve of us sat down to eat twelve courses, symbolising the twelve apostles. An extra place was laid for the souls of dead members of the family. The meal contains no meat or dairy, and so we feasted on an array of grains, vegetables and fruit. Dishes included borscht, sauerkraut, dumplings with mushroom sauce, cabbage parcels, quinoa, salad of pickled vegetables, wilted spinach with cheese, and winter fruit compote. After the meal our fabulous chef, who'd been clad in angelic whites all evening, as cook and hostess extraordinare, disappeared. She then re-emerged, dressed all in black, and started whirling, dervish-like, around the garden, brandishing fire torches. As a nearly-full moon lit up the garden, a blast of fireworks was sent into the sky. Amazing. Thurlestone Rock is a graceful arch just a short way out from the beach; swimming to it - and through it - was our New Year's quest. We were also celebrating a year of group outdoor swimming. Twelve months ago today, several of us plunged into the sea at Bantham (three, including me, getting caught in a rip current in the process - a somewhat inauspicious start). That was the first of many swims around Devon together. Today eleven of us swam at Thurlestone; the sea was grey and every seventh wave was a crasher. Five of us, (not including me) made it through the gap in the arch. Afterwards we had a big fire on the beach, and drank a variety of reviving tipples including coffee, chocolate, soup, brandy and bubbly. What could be be more worthy of celebration than friendship and swimming?